When arriving at the restaurant we were guided to our seats right by the window. The entire place was heaving with people already enjoying their food, which made the atmosphere perfect, with just the right level of background noise. Our waitress didn’t mind our poor attempts at pronouncing our choices from the menu either, which is always a bonus. 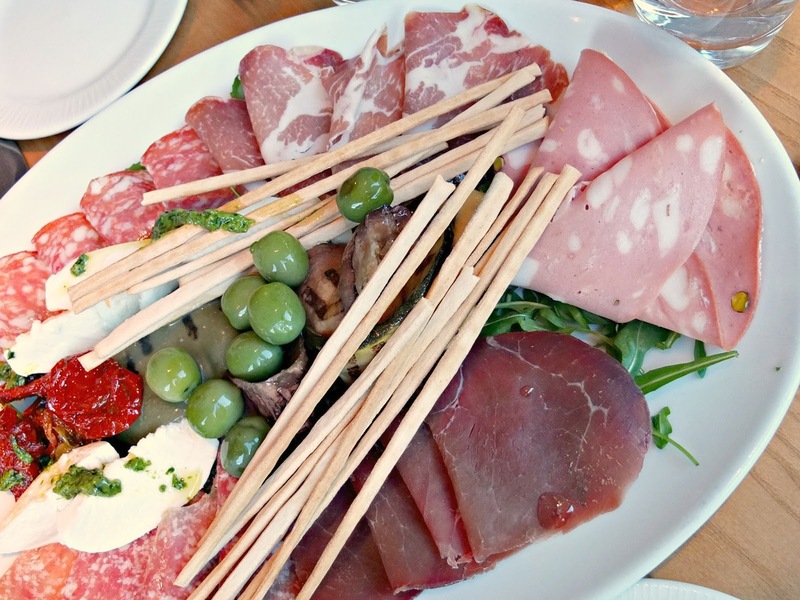 After settling in to our seats, we quickly ordered the Antipasti selection for two, which helped us to fuel our way in to choosing our main courses. There was so much choice on the menu it was really hard to narrow it down to a short list of options. The starter selection was a delicious combination of cold meats, alongside roasted aubergine and peppers with a handful of thin grissini sticks on the top. Not to mention the sundried tomato and mozzarella, with a dash of pesto completed this extra large plate of absolute deliciousness. To be honest, I could have stopped this foodie experience after this, as my belly was satisfyingly full already. However, in the spirit of the review I continued on to the main course. 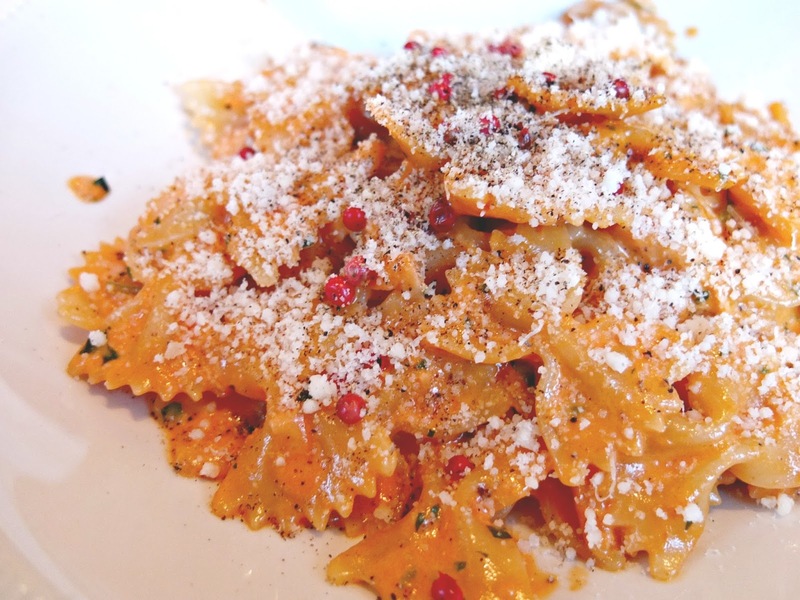 From the pasta section of the A La Carte menu I chose ‘Farfalle Al Salmone’, which was ribbon pasta (aka those little bow tie shaped ones) with delicious pink smoked salmon stirred through a dill and peppercorn cream and tomato sauce. 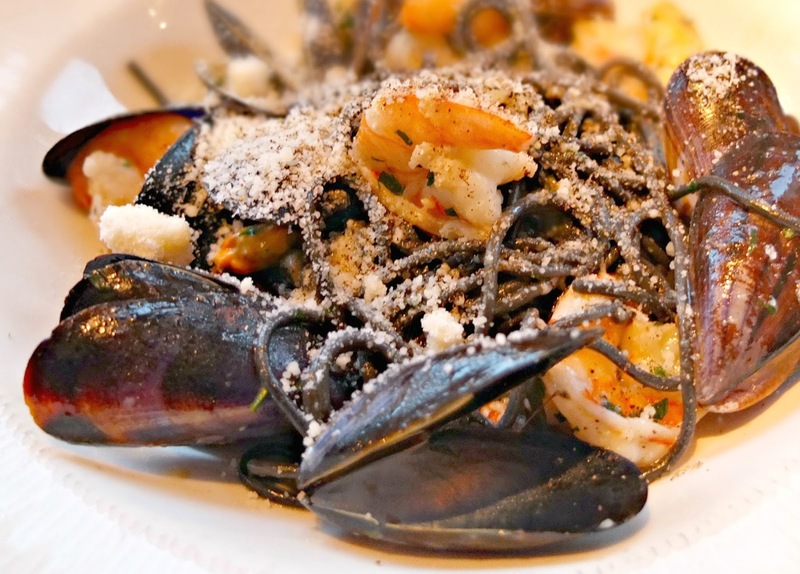 My date for the evening also went down a fishy route with their option and chose Spaghetti Nero di Seppia, which was squid ink spaghetti with prawns and mussels in a delicate white wine sauce. As we’d both chosen dishes with a sauce base, we knew we couldn’t risk any of the flavour going to waste, so also went for the rosemary and rock salt focaccia to mop up any remainder. It’s safe to say that all three dishes lived up to expectation. The Salmon pasta had just the right amount of creaminess, alongside a deliciously rich flavour all bought together by the tangy spice of the peppercorns. The squid ink spaghetti looked a little intimidating in appearance, which it’s ultra dark, black colour; but once you got your head around the colour it was more than delicious with the ultra juicy prawns. Despite both main courses being really amazing, I must admit, the thing that got me hankering for more was the focaccia bread. It was just *so* good. So, so, so, so, sooooo good. I almost felt like crying when I couldn’t fit any more of it in to my stomach. And believe me, I tried. Despite being fit to burst, we knew we could not leave without trying a dessert (or two). One could say we are gluttons for punishment… Or perhaps just absolute gluttons. I mean, no human needed this much lavish food in one evening. But we did it. For the good of blogging WE DID IT. After a quick browse of the dessert menu and brisking over the sorbet option, we settled on a Creme Brûlée and a Tiramisu to share. 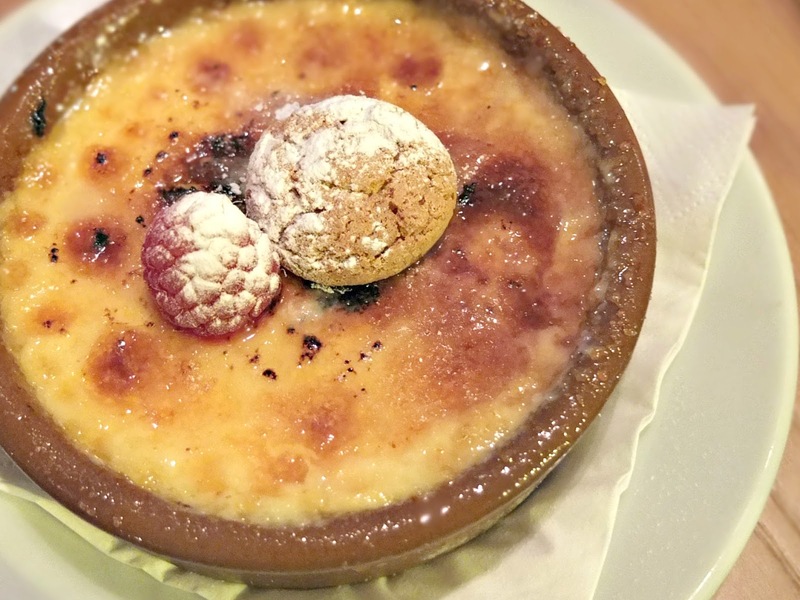 I must admit, the creme brûlée left me a little on the disappointing side, as it didn’t seem to have that really satisfying crunch you usually get on the burnt sugar top, and it was quite cold throughout. I always love when you have the really warm bits contrasting against the cooler creamy bits in your mouth! However, the flavour and consistency of the dish was spot on. As for the tiramisu? WELL, this ticked allllll the boxes for flavour, texture and satisfaction. We both loved it. 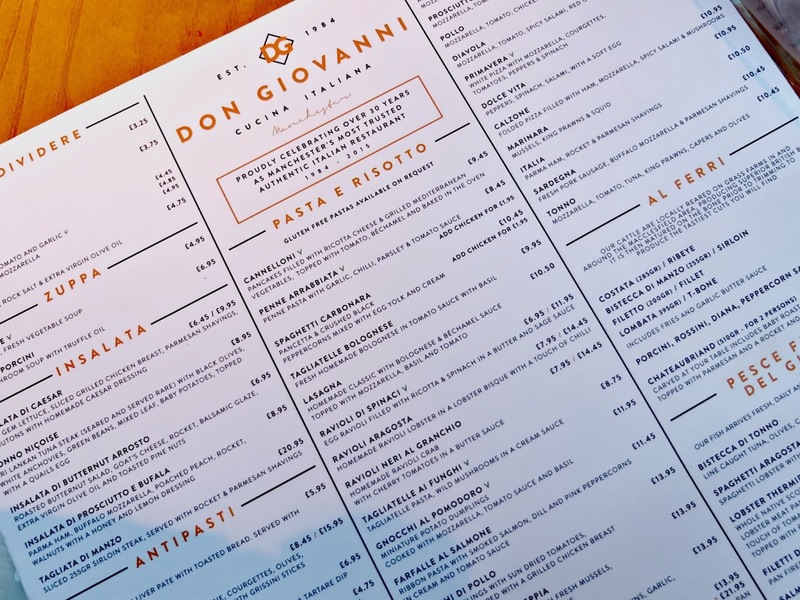 All in all, Don Giovanni in Manchester was a delicious taste and texture journey, showcasing exactly why they have stood the test of time within the ever changing face of Manchester restaurants. Winning multiple awards, the quality of food and excellent service spoke for itself and has definitely changed my entire opinion on Italian food! ‘Plain’ is the last thing this little lot could be described as. Massive thanks for having us Don Giovanni, and an extra shout out for the hospitality of Enzo who introduced himself after our meal just to say hello.